How do I de-cross-list a Section? 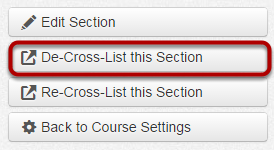 Note: You can only cross-list a section after you have opened the course where the section currently resides. 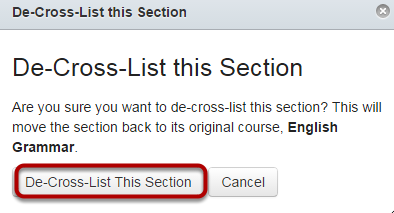 Click the De-Cross-List This Section button to confirm the de-cross-listing. The section will be moved back to its original course. Note: All grades for students in this course will no longer be visible. You can retrieve the grades later by re-cross-listing the course, but in the mean time the grades for these students will come from the original course.